Dr. Joanie Connell studied electrical engineering in college so she could make a decent living. She earned her B.A. in Engineering from Harvard University. After she graduated, she worked as an electrical engineer in Silicon Valley. Though she was making great money, Joanie was unhappy and had no passion for her work – she was much more interested in the people than the circuits. Try as she might to get more people-oriented work, such as marketing, she was always pushed back into her technical role as an engineer. She realized she needed to go back to school to re-specialize. Joanie didn’t take this decision lightly because there was a huge loss–money, career–and it was risky to try something new. She spent a long time going through the book “What Color Is Your Parachute“, talking to people about what they saw her doing, taking courses after work, and volunteering to try different things out. Eventually, she went back to graduate school to study psychology so she could be a Communications Consultant, earning a Ph.D. in Psychology from the University of California, Berkeley. Now she focuses on leadership development. One of her niche areas is helping technical people (like engineers) be better leaders. As a professor, Joanie has taught business and psychology students of all ages at the Rady School of Management at the University of California San Diego, the California School of Professional Psychology at Alliant International University, and in the Masters in Human Behavior program at National University. Joanie is author of “Flying Without a Helicopter – How to Prepare Young People for Work and Life“, is an organizational consultant and leadership coach working with companies and individuals, developing leaders and helping companies to attract and retain top talent. Just a few of her clients include Apple, Boeing, Cisco Systems, Hewlett Packard, United States Post Office, and United States Navy SEALS. 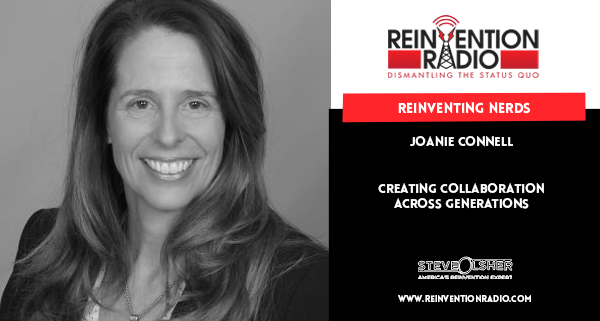 Tune in to hear Joanie, Steve, Mary, and Richard discuss how she works to create collaboration across generations, helps teens develop REAL life skills and brings teams from dysfunction to well-functioning. Why didn’t she go to MIT? Joanie’s prediction for the next tech revolution. Reinventing The Naked Truth – In this episode, tune in to hear Joie Cheng chat with Steve, Mary, and Richard about how she healed herself naturally from deep depression and suicidal thoughts through self-love.